Is the Prosecco Boom Sustainable? Is the Prosecco boom sustainable? Or is it a bubble that’s eventually going to pop? That’s roughly the question that an Italian journalist asked me a few weeks ago and it is easy to appreciate the concern behind it. The market for Prosecco has blossomed, especially in the U.K., U.S., and Germany, the three largest export markets, and Prosecco producers are both excited and anxious about their future prospects. A quick glance at data for U.S. sparkling wine imports January-June 2018 as reported by Wine-By-Numbers (see above) shows strong growth. Italian sparking wine (mainly Prosecco) imports grew 16% by volume and 28.3% by value in the first six months of the year despite rising average dollar import price. Only the Rosé import category is growing faster than Prosecco. I am a wine-glass half-full kind of person, so my answer to the journalist’s query was optimistic. The question isn’t so much why U.S. and U.K. consumers are drinking more sparkling wine (and especially Prosecco) now — it is why they didn’t embrace bubbles more ardently in the past? Sparkling wine has always been an attractive option, but for some reason it became associated with special occasions. Bubbles aren’t just for birthdays and New Year any more. But booms often contain the seeds of their own demise — either in the form of bust, fizzle, plateau, or something else. Prosecco may be no different. Having just returned from a quick visit to Prosecco-ville to speak at an award ceremony in Conegliano (see next week’s column), I can report that there is concern about this possibility within the industry. Most of the Prosecco on the market is DOC Prosecco produced by makers that range from the very large such as La Marca, which is distributed by Gallo, to the relatively small. There are economies of scale in Prosecco-making, so bigger can be better from a profit standpoint. La Marca, for example is a second level cooperative — a cooperative of cooperatives — and its many members keep its pressurized tanks, used for the secondary fermentation, efficiently supplied with a river of base wine. When quantity is the driving force, the focus can easily become one of chasing the market to increase sales, raise production, increase scale economies, and lower cost. Thus there is an incentive to look for incremental sales wherever they can be found. This might be part of the movement to certify DOC Prosecco Rosé. Bubbles are hot. Pink wine is hotter. Pink bubbles should set the market on fire. The Glera grape that is used to make Prosecco is white, not red, but production rules allow the use of up to 15% of other approved grape varieties. If those grapes are Pinot Noir, which is grown in this region, the result is a pink sparkling wine. Pink Prosecco isn’t a thing yet, since the rules don’t allow this designation, but it might be permitted very soon. Pink Prosecco — who could object? Well, many people, actually. The concern is that Prosecco’s identity is not well established — many consumers think Prosecco is the grape name and others are not certain exactly sure where it comes from. Prosecco’s success may come in part from the fact that consumers don’t fret about these things and simply enjoy the experience. But some producers worry that by broadening the Prosecco category with a pink wine, winemakers will further dilute the brand identity to the point where it is just a generic sparkling wine, one of the ingredients in Aperol spritz, unable to command a price premium. The slope that runs down the commodity wine hill can be slippery. At one point during our visit I joked that, since blue wines are getting some attention these days, maybe some Prosecco producers would move in that direction. Pink, Blue, White — all colors of Prosecco for all occasions. No one laughed. I guess blue Prosecco is nothing to joke about. It’s part of that slippery slope. 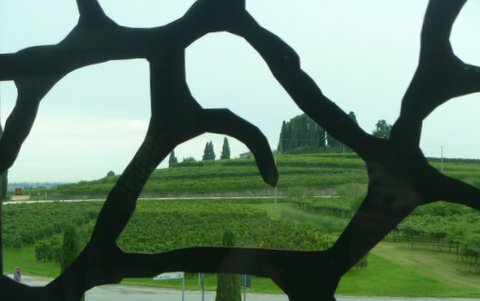 The concern that Prosecco’s brand may be undermined seemed particular strong in the Prosecco Superiore DOCG zone between Conegliano and Valdobbiadene. Supply is more limited in the DOCG zone and costs are higher because, unlike the valley vineyards where much DOC Prosecco is grown, the hillside terraces aren’t all suitable for mechanical harvesting or as easy to maintain generally. Prosecco Superiore is therefore about value more than volume and maintaining product differentiation — of Prosecco versus generic sparkling wine and of DOCG Prosecco versus DOC production — is very important. Wine marketing guru Paul Wagner, who led our small press tour, never got tired of pointing out what a challenge the DOCG producers set by branding themselves as Prosecco Superiore Conegliano Valdobbiadene DOCG . What a mouthful! Prosecco Superiore suggests a premium product and is probably the right brand to try to build, although Americans have little experience with the Superiore designation for wines generally. The Conegliano-Valdobbiadene reference is meant to indicate that these are wines of origin — grown in a particular place, but most consumers don’t know what that place is or exactly how to pronounce the place names either. I have done Prosecco tastings for non-profit groups and I note that consumers are often surprised when they taste the DOCG product, especially DOCG Brut. They like Prosecco a lot, but think of it generically as defined by DOC Extra Dry wines. They are surprised when they can taste a difference. (I’ve had the same reaction in tastings of Argentina Malbecs from different production zones). Based on my very limited personal experience, it seems to me the key to differentiating Prosecco from other sparkling wines and DOCG Prosecco from the DOC wines is going to involve a lot of hard work. Consumers won’t understand the differences if you just tell them. You can’t tell people how something tastes. You have to show them, and let them experience it for themselves one glass at a time. Is the Prosecco boom sustainable? Yes, I think it is, but it will take work to shore up its foundation and simply chasing market share, as tempting as that it, may not be the best long-term strategy. If you have ever visited an IKEA store I’m sure you have vivid memories of the experience. The stores are huge (30,000 square meters on average, I’m told, although there’s one in South Korea that’s almost twice that size). Each store is organized around a journey that customers take from room to room, space to space, category to category, pausing only at the restaurant for Swedish meatballs before passing through the check stands, their bags and carts filled with Scandinavian-inspired home goods. IKEA of Food and Wine? FICO Eataly World, located just outside of Bologna, Italy, reminds be a bit of IKEA, especially because of the journey its visitors take. But there are many differences, too. Eataly World is much larger than an IKEA store. At 100,000 square meters (over 1 million square feet! ), it is more than three times the size of your typical IKEA and almost twice as large as that Korean super-IKEA. Food (and wine) are at the center of the experience. And Italy, not Sweden, is the guiding star. Sue and I visited FICO Eataly World during a recent stop in Bologna, where we lived for a semester some 20 years ago when I taught at the Johns Hopkins School of Advanced International Studies Center there. We’ve visited other Eataly locations in the past — New York City, Milan, and the much smaller Eataly Bologna located in the historic center’s famous market, just steps from our old apartment on Via Pescherie Vecchie. But this one was different in more ways than scale. FICO (Fabbrica Italiana Cantadina) Eataly World is located outside the city core, close to the convention centers that draw thousands of visitors to Bologna each year. Lots of free parking and regular bus service from the train station makes it easy to access. But the location on the outskirts changes things a bit — Eataly World is a stand alone culinary theme park destination where the other Eatalys we’ve visited have been more integrated into their neighborhoods. The Eataly stores in New York and Milan bring a whole Italian market, with shops, restaurants, and vendors of fish, cheese, salumi, fruits and vegetables and so forth, all under one roof with all the hustle and bustle you would expect. The central Bologna Eataly is a little different — the bookshop is the main feature that I remember — but that’s because it is embedded in a historic bustling market just off Piazza Maggiore and does not need to recreate one. The food court, located across the alley from the main store, is a fine addition since our last visit. Eataly World’s vast scale suggests a grander vision. There are dozens of shops and stalls featuring distinctive foods from all over Italy, and 45 “eating points” — kiosks, cafes, restaurants — serving regional cuisine. There are 20 acres of small demonstration farms and vineyards, so you can meet the pigs and squeeze the grapes, and some of the final products are actually produced on site. We ran into a group of small children who watched in fascinating through a glass wall as a robotic baker made batch after batch of tasty cookies. You can make of Eataly World what you like — a place to shop or hang out, a place to eat and drink, or even an opportunity to exercise (you can rent bikes to shorten your journey time inside the big building). But education is an important function, too, both the organized classes that are always on offer and the one-to-one conversations with staff at each stand. One of our goals in visiting FICO Eataly World was to see how they dealt with Italian wine. This is a big task as Italy is home to hundreds of grape varieties and thousands of wineries. I nearly went crazy trying to narrow the wine list down to a few important wines in my book Around the World in Eighty Wines. It would take an IKEA-sized facility to do real justice to the diversity of the wines of Italy — and that is more space than even Eataly World has to spare. That said, the wine program we found was very good. There were 2000 wines for sale, organized by Italian region as they should be, ranging from modest to noble. More to the point, there were 100 different wines available by the glass or in flights. A knowledgeable young staff member ascertained our interest in learning about Lambrusco and arranged a small tasting of two completely different ideas of the wine, both quite dry but one dark and powerful and the other lighter and fruity (see photo below). It was a good experience and a good way to learn about the wines and have fun, too. Wine calls for food and there was a nice Bolognese restaurant attached to the wine shop — one food/wine option among many at Eataly World. We had lunch at a foccacia shop (we saw the foccacia being made in front of us). I had a sandwich with Mortadella and a glass of that dark Lambrusco — great combination. So what should we think of FICO Eataly World and its ambitious wine program? Well, what do you think of IKEA? Personally, I find it kind of bewildering with the crowds, noise, and its cornicopia of products, most of which are irrelevant to my life. But I like to go there — yes, for the meatballs — because it isa place where I can get ideas and stumble upon things that I didn’t know I would like. It surprises and delights more than it confuses, I guess. I kind of like FICO Eataly World in the same way I kind of like IKEA. Based on our single visit, it seems full of stuff that overwhelms but gives me ideas and a chance to stumble on something I wasn’t looking for (the Sicilian shop and its great cannoli and espresso). But there is a big difference between IKEA and FICO Eataly World. Ultimately IKEA succeeds when it allows its visitors to find their own voice, in a way, through the designs that they choose and the products that they bring into their homes. That’s a big challenge and it says something about IKEA that it is so successful. But Eataly World sets even a bigger challenge. It wants to tell the story of Italian food and wine and that topic is so vast and complex that it makes IKEA seem simple by comparison. I am not convinced that Eataly World really does justice to its mission, but how could it? It was fun to visit and see which elements of Italian food and wine culture stood out and which ones did not. Sue’s take on Eataly World was quite positive. It was like a giant first-class IKEA food court where you wanted to try everything even though that would be impossible to do. She especially appreciated the educational components and loved the family-friendly animal exhibits. She thought that, taken on its own terms in both the food and wine components, Eataly World represents Italy very well. Will we go back to Eataly World on our next visit to Bologna? I dunno. We were there on a quiet Friday morning. I’d like to visit the place when it is busier just to see if it feels like the Bologna market when it is crowded, which is pretty much all the time. But that Bologna market neighborhood is fantastic — Italy World — and I’m not sure Eataly World can compete with it! If I had to choose between Eataly World markets and the real markets in the centro storico of Bologna, there is no question where I would go. I’d be having a glass of Pignoletto frizzante wine and a plate of Mortadella at Simoni’s Laboratorio on Via Pescherie Vecchie every time rather than taking the red bus out to the fiera district. Here is Sue’s photo of two very different ideas of Lambrusco. Enjoy! The Wine Economist returns to the road in a few weeks. Here are some of the stops we plan during the summer months. I’ll be speaking about “Around the World in Eighty Wines” and leading a wine tasting as part of the University of Puget Sound’s Summer Reunion Weekend Alumni College. June 8-9, 2018. The good folks at Carpenè Malvolti, the famous Conegliano Prosecco house, have kindly donated some of their fine wine for a tasting. Lucky alumni students! Sue and I will be in Forte dei Marmi, Italy on June 18 for VinoVIP. I will talk about money and wine in the global market context. I am very excited to join a group of Italian wine luminaries on the program and to meet everyone at this great event at the famous Italian seaside resort. We will stop briefly in Bologna on our way to VinoVIP to see old friends (I taught at the Johns Hopkins/SAIS Center in Bologna many years ago) and to visit Eataly World. “SWOT of Italian wine industry” (Piero Mastroberardino). Quite an all-star lineup! I will take part in a panel discussing “Competing on a Global Stage” at the California Association of Winegrape Growers Summer Conference at the Silverado Resort in Napa, California on July 17. I’m happy to speak at a private program featuring “Around the World in Eighty Wines” to support the Northwest Sinfonietta music organization on July 29. Sue and I are tentatively planning to participate in the 3rd global wine tourism conference sponsored by the United Nations World Tourism Organization (UNWTO) The conference will be held on September 6-7 in Chisinau, Moldova. We hope to visit Romania after the UNWTO conference and perhaps give a talk to celebrate publication of the Romanian-language translation of Wine Wars. Details tba. Flashback Friday: Can Wine Tourism Take Center Stage in Valpolicella? Sue and I have wine tourism on our minds these days because we are getting ready for the United Nations World Tourism Organization’s global wine tourism conference in Mendoza, Argentina later this month. We were in the Veneto at this time three years ago and wine tourism was on our minds there, too. 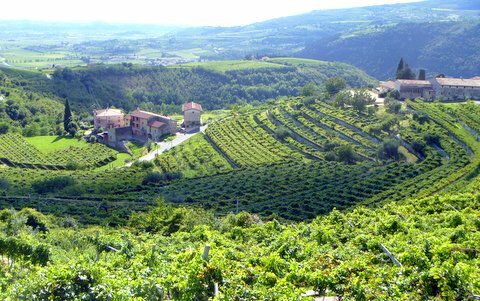 Here is a Flashback Friday column from 2014 about wine tourism in Valpolicella. But what about wine tourism? Sue and I were guests of the Valpolicella Consorzio earlier this month and one of our tasks was get a sense of Valpolicella as a wine tourist destination using a new wine tourism app (available as free download for Android and Apple mobile devices). Here is a brief report. Whenever I asked the winemakers we met if wine tourism was an important part of their business the answer was “yes!” but I think it is fair to say that for many of the actual tourists wine is at best a secondary reason for their visit. The fact is that most tourists come to this part of Italy for non-wine reasons — for the history, culture and opera of Verona to the east, for example, or the resorts of Lake Garda to the west. Lying between these two attractive poles, Valpolicella is the perfect “day out” diversion (especially if it is a rainy day as has too often been the case in 2014) but not always the primary destination. Come for the beach or opera, stay for the wine! That could be Valpolicella’s wine tourism motto, but it would be selling the region short. What do dedicated wine tourists look for? Well, these days they want the complete experience — the wine and wineries, of course, plus beautiful scenery, great food, comfortable lodgings and that something extra to tell their friends back home about. Valpolicella would seem to tick each of these boxes. The vineyard scenery is certainly spectacular — I really wasn’t prepared for the beautiful vistas. What a stunning setting! A great opportunity for fit cyclists with a nose for good wine or anyone willing to pull off the road and take in the panorama. The wineries we visited using the Consorzio’s app showed the great variety of experiences available, which ranged from the super-modern architecture at Monteci to the classic and traditional at Valentina Cubi (one of our favorite stops). The sense of history was particularly strong at Santa Sofia, which is located in a villa designed by Andrea Palladio in the 16th century. You cannot dig much deeper into the soul of the Venteo than that! Zymé, Celestino Gaspari’s ambitious winery in Pietro in Carlano deftly balanced the very old and the very new. The winery building features cutting edge architecture — see the photo taken looking out from the structure towards the nearby hillside vineyards. Wow! The Zymé cellar and caves are carved into the hillside and touring them gives a sense of both history and nature. One of the best surprises was in the cavern than has become the working part of the winery. A spring that was discovered during construction was incorporated into the design and you can actually look down dozens of feet into the crevasse that the water has carved out over the years. A stunning sensory experience (and great for the humidity needed for barrel storage). Wine tourists need a place to stay and there seem to be many attractive options (this part of the Consorzio app is still under development). Although we stayed in a basic business hotel on this trip, we encountered a number of options, including very appealing apartments at Valentina Cubi. If you want luxury, well there seem to be a number of five star experiences available. SalvaTerra’s beautiful estate includes vineyards, the winery, a small hotel and what must be a fine restaurant (judging from the number of chefs we saw working the kitchen as we passed by). We have no doubt about the food at Villa Cordevigo since we were fortunate to have dinner at this estate that includes the Villabella winery, its vineyards, a fantastic hotel and spa and the sorts of amenities that make you want to linger forever. Or at least that’s how it seemed to us as we looked out over a garden to the pool and the vineyards jvust beyond with a full moon in the distance. People talk about coming to Italy for the art and architecture, but let me tell you the truth. It’s the food! And we were fortunate to sample many typical dishes of the regional cuisine and they are worth the effort to seek out. Typical is an interesting word in this context — you see it everywhere in Italy and that’s a good thing. Here in the U.S. “typical” is sometimes a term of derision — Big Macs are “typical” fast food, for example. Ordinary. Unexceptional. Nothing to write home about. That’s typical for us. In Italy, however, typical means “true to type” or authentic. And that’s why we Americans go gaga over Italian food — the authenticity just blows us away. And the authentic or typical dishes of Valpolicella, many prepared with the wines themselves, are enough to make any foodie go gaga. We enjoyed great meals at the Villa Cordevigo, Ristorante La Divina (overlooking Garda from high on a hill), Locanda 800 and the Enoteca Della Valpolicella. We also appreciated the lunches that several wineries put together for us including a wonderful (typical!) meal of local meats and cheeses with polenta at Scriani, a satisfying buffet at Santa Sofia and a rather elaborate multi-course feast of typical dishes at the Cantina Valpolicella Negrar. All the food was wonderful — the meats and cheeses at Cesari and the completely addictive “crumb cake” we had with Recioto at Secondo Marco. Foodie paradise? You be the judge. And great wines, too. Valpolicella seems to have all the elements of a great wine tourism experience and I think the Consorzio’s app ties things together into a functional package. It will be even more useful when it has time to fill out with more wineries, restaurants and hotels. Is the app alone enough to bring Valpolicella to center stage? Of course not. Some of the wineries obviously embrace wine tourism more completely than others, for example. It is important that three or four true “destination” wineries emerge that will make it easy for wine tourists to see that a two-day or longer visit can be fashioned that will sustain their interest and enthusiasm — with dozens of other wineries providing rich diversity (and reasons to return again and again) as happens in Napa, for example. And finally there must be even closer ties among the elements of the hospitality sector — wine, food, tourism and lodgings — which is not always easy to achieve. It takes a village to build a wine route. But all the pieces are there and the app is a good way to bring them together. But what about that “something extra” I mentioned earlier. What does Valpolicella offer that will push it over the top? Well, the towns and villages have the churches, squares, museums and villas that Italian wine tourists expect — it takes only a little effort to seek them out and I must confess that I actually enjoy the “small moments” more than the three-star attractions, so this suits me very well. But maybe I am making this too hard. What’s that something special? Maybe it’s the chance to tack an evening in Verona or a day on Lake Garda on to your Valpolicella wine tour experience? Perhaps its time for the wine tail to wag the Veneto tourist dog and not the other way around! (Gosh, I wonder how that will sound in Italian?) Food for thought! Here’s a musical tribute to the merry band of wine bloggers on our Valpolicella tour. Mauro Fermariello has created a beautiful video of our Valpolicella wine blogger tour, which can be found in his website, www.winestories.it . Tre Bicchieri — three glasses. Those are important words if you are interested in Italian wine. 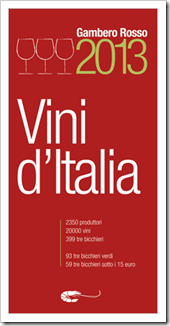 The Michelin Guide gives up to three stars to the top restaurants in France and around the world and perhaps for that reason Gambero Rosso magazine’s Vini d”Italia gives up to three glasses to Italy’s finest wines. For the 2015 edition the editors surveyed 2042 wineries and evaluated 20,000 wines. Just 423 (about 2 percent) received the tre bicchieri rating. Friuli Venezia Giulia punches above its weight in the Gambero Rosso rankings with 27 tre bicchieri awards listed in the 2015 league table including wines from three wineries that I mentioned in my last column: the Rosso Sacrisassi 2012 from Le Due Terre, the Sauvignon 2013 from Tiare, and the Sauvignon Ronco delle Mele 2013 from Venica & Venica. The quality of the Friuli wines is high and rising and deserves greater attention. We visited three wineries (the “three glasses” of this column’s title) that impressed us both for the three glasses-worthy wines and also for the different ways they are advancing the reputation of the wines of this region. We first learned the story of Borgo San Daniele in my dog-eared copy of Slow Wine 2014, which awarded the winery its “snail” designation for giving particular attention to the values of the Slow Food movement (I wrote about Slow Food in my Globaloney books). It is the philosophy of Slow Food that tradition and nature are best preserved if they are valued in the marketplace and so the Slow Food and Slow Wine movements seek to identify producers of traditional and natural products and then draw wider attention to them. There was a special room set aside for Slow Wine producers at the Italian Trade Commission’s Vino 2015 symposium in New York City earlier this year, for example, and it was always buzzing. 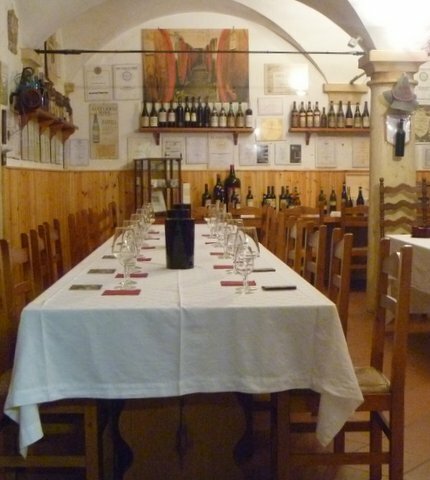 Borgo San Daniele fits right into the Slow Wine philosophy. Mauro Mauri and his sister Alessandra inherited vineyards from their grandfather in 1990 and have spent the last 25 years renewing the land and the vineyards and developing wines with a quite distinct local identity that reflects their own gentle but determined personalities. We were fortunate to be able to stay at the winery, meet Alessandra, and taste the wines with Mauro. The Borgo San Daniele wines have an extraordinary reputation in Friuli — restaurants and wine shops that are lucky enough to get a few bottles display them proudly. Only a few different wines are made, each from specific varieties or blends and each from a particular place. The land, not demand, limits production and when it is gone it’s gone. Vineyards are 18 hectares in total, according to Slow Wine, and about 14,000 cases are produced. Each of the wines we tasted was distinctive and memorable, but the Arbis Blanc and Arbis Ròs stand out. Arbis Blanc, from the grassy San Leonardo site in Cormons, is considered a defining Friulian white. It is a field blend of Sauvngnon, Chardonnay, Pinot Bianco and Friuliano, with subtly integrated Slovenian oak. Arbis Ròs is 100% Pignolo from the Ziris site in Cormons. 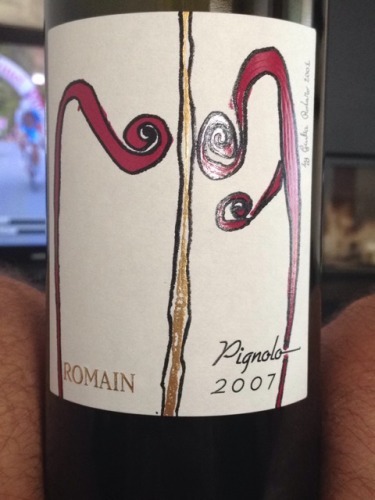 It was one of the two best Pignolo wines (along with Rodaro Paolo) that we tasted. Mauro served us the 2009 Arbis Ròs from magnum and it was simply stunning. I desperately wanted bring home a bottle of Arbus Ròs to lay down and see if Maruo was right that it would continue to evolve and start to develop Asian spice notes in 8-10 years. But the standard bottles of this wine were long sold out and I didn’t think I could get one of the few remaining magnums home successfully. 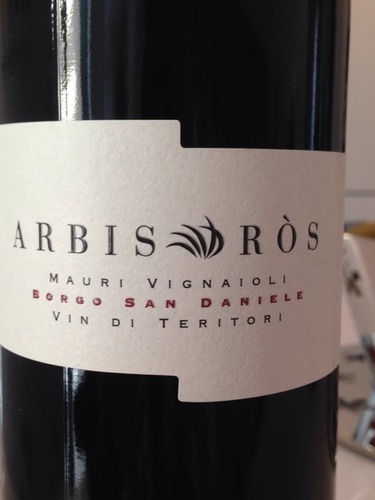 So there is just the memory of Mauro, Alessandra and the Arbis and other Borgo San Daniele wines. Their personalities (which I think come out in the video at the end of this column) are so distinct that I am sure the memories will last. Slow Wine brought us next to Rodaro Paolo and to meet the very intense and focused Paolo Rodaro himself, the 6th generation of his family to make wine in this region since 1847. The current winery makes about 16,000 cases of wine from the 57 hectares of estate vineyards (40 hectares on the hillsides). The vines are split 50/50 between red and white grapes, an increase on the red side (Pignolo, Schioppettino, Reofsco) over the years as climate change has improved the ability to ripen these grapes. Slow Wine told us that the entry-level wines are a bargain for the quality (and we tried them a few days later over dinner at a simple country trattoria across the street from the winery). But we came to learn about the Romain wines. Paolo Rodaro is committed to bringing out the very best of the traditional local wines that he produces and he intensely channels this desire through experimentation and innovation (evolution, not revolution), with some quite spectacular results. The flagship Romain wines, for example, are the result of an experiment in drying red wine grapes before pressing and fermentation. Paolo observed the beneficial effects of “appassimento” air-drying of Picolit and Verduzzo Friulano grapes for sweet wines. Would air-drying also bring out intensity and character of some of the red wines? The answer we found in our glasses is a clear yes. Drying very ripe red grapes for 3-4 weeks through the “surmaturazione” process (versus 3-4 months for the white grapes) achieved maturity, concentration, and balance. The resulting wines are dry and therefore high in alcohol but extraordinarily balanced and capable of significant aging. These were some of the best red wines we have ever tasted and it was an honor to discuss them with the man who made them. The discussion was very personal — as when we tasted with Mauro at Borgo San Daniele. Both men make a statement about themselves and their idea of Friuli through the wines they put in a bottle. Both limit the production of the wines that make the strongest statements — Paolo released just a few hundred bottles of some wines each year and makes them only in years where conditions are ideal. We felt fortunate to leave with a bottle of 2009 Refosco Romain. My tasting notes rave about the depth and elegance of this wine and I can’t wait to taste it again in eight or ten years (a timetable we negotiated with Paolo, who encouraged us to wait even longer). The personal touch extends to the label design shown here, which was created by Paolo’s daughter Giulia when she was 5 years old. It looks like a curling vine, but it is really an abstract representation of the family home’s wrought-iron gate. It would be easy to dismiss Bastianich as just another celebrity winery. Lidia Bastianich and her husband Felix fled their home in Istria (just across the Adriatic from Venice) during the dark days after the Second World War, eventually making their way to the United States where they slowly worked their way up in the world using food as their ladder. A restaurant (Bounavia) arrived the same year as a son, Joseph. Lidia Bastianich is now a celebrity chef with cookbooks and a PBS cooking series to her credit. Joseph is a celebrity in his own right — business partner of Mario Battali in several famous restaurants, former judge on MasterChef USA and now host and judge on MasterChef Italia. It would be easy to say that the Bastianich winery in Friuli is just another example of a celebrity using wine to cash in on transitory fame. But it isn’t true. In fact, against all odds, I think the first sentence you find on the Bastianich website holds true: “The Bastianich winery, founded in 1997, strives to understand the history and culture of Friuli-Venezia Giulia and take it to a new level.” Sue and I toured the vineyards and winery with Wayne Young, an American who has been with the project since the first vintage in 1998 and is very much part of Friulian wine society (he sits on the board of the Coli Orientali Consorzio, for example). It was clear in talking with Wayne that although the Bastianich owners are American, the winery and its wines are not just Italian but Friulian through and through and that to the degree that celebrity comes into play, it is an asset that is used to try to draw attention to the region. Take the wines, which is the right place to begin. Vespa Bianco and Vespa Rosso are the flagship “tre bichiere-class” products (Vespa is Italian for “wasp,” inspired by the swarms of wasps that descend at harvest time) and they are authentic blends of local grapes that will introduce many wine drinkers to the wine styles of this region. We’ve enjoyed Vespa Bianco many times over the years, but never the single-variety Plus (from old vine Friuliano planted near Buttrio) and the Calabrone (Italian for “hornet”), a blend of Refosco, Schioppetino, Pignolo and a bit of Merlot. All the Schioppettino and some of the Refosco are air-dried before vinification. Celebrity creates barriers that can only be overcome by performance. These are authentic wines and the intent is to take them to the next level while respecting tradition. Celebrity also opens some doors for the wines and the region. This is literally true with Orsone, the Bastianich restaurant, taverna and B&B down the hill from the winery which is worth a trip even if you (gasp!) do not care about wine. The menu at Orsone gives respect to local culture while also giving an occasional nod to New York. We asked the chefs to choose our meal and the sommelier to pair Bastianich wines with each course with a predictably delicious result. My primo course was a burnt wheat orecchiette that honored the tradition of Italian peasants making one final pass through the fields after they have been burnt in the fall, looking for every last bit of wheat, no matter how scorched. Quite an experience. So what do these three wineries have in common? A commitment to authenticity, which they have developed in distinctly different circumstances. The three families approach Friulian wine from very different angles and tell its story if very different ways. Tasting these wines and learning about the makers gives a sense of the journey that Friulian wine has taken and the road that lies ahead to greater global appreciation in the future. Many thanks to Alessandra, Mauro, Paolo and Wayne. I found videos of the three wineries featured here and I thought I would share them to give you a taste of Friuli wine. Enjoy!